Eliminate Lice in 3 Easy Steps! Littlebugs products prevent and treat lice without pesticides or other toxic, harsh chemicals. Ingredients like yeast-based enzymes, olive oil and peppermint naturally eliminate and prevent lice infestations. 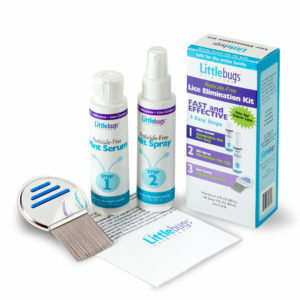 Littlebugs products include both lice elimination and lice prevention solutions to keep your family free from lice. Are safe for the entire family. Good for your scalp and hair. Are made from over 96% Natural resources. Are made from 100% Renewable resources! Are made in the USA! We realize there are many head lice products and treatments available. That being said, we provide a pesticide-free lice removal solution that you will feel safe using to eliminate these pesky bugs from your children, or even yourself. You may have tried a lice removal shampoo or other treatment in the past. Some require repeated application, which can be messy and ineffective. In addition, many head lice products contain potentially dangerous pesticides, which you certainly don't want to use on your children! Why are we so familiar and experienced with this issue? As two mothers of children who have been affected with the spreading of head lice at school, we know what you are going through. Aside from being qualified lice treatment technicians, we are also both registered nurses. Concerned about using toxic shampoos and "homemade" remedies that may not be effective, we decided to develop our own effective solutions. Lice is prevalent not only in schools, but nursing homes, camps, and other locations where there are many people present. Our efforts resulted in heal lice shampoo and other products that are effective for removal, while free of pesticides and other potentially dangerous chemicals. We understand that parent desire a lice treatment that is affordable and effective. At Littlebugs Hair Care, we provide lice removal products that are effective and budget-friendly, without harsh chemicals that may or may not be effective. To learn more about our innovative new head lice removal options, browse our website or contact us a call today at 855-804-8887. 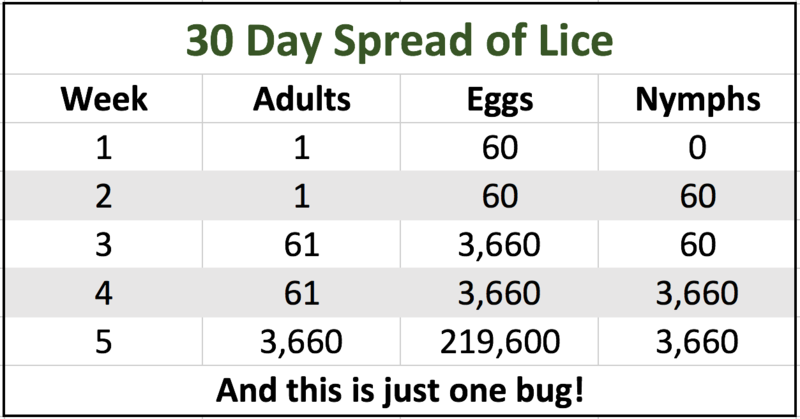 Summer, a Busy Season for Head Lice! While you might assume that since school's out you don't have to worry about head lice as much, unfortunately quite the opposite is true. Summer brings about warm temperatures, which means more outdoor activities and kids getting together to play, have a sleepover, or go to camp. Neighborhood kids tend to congregate whether it's to ride bikes, play ball, go swimming, or play in the sandbox. Lice don't take the summer off, so don't let your guard down! Lots of children and teens attend various summer camps. Unfortunately, it's these crowded situations that often result in a head lice infestation. It doesn't make a difference whether your kids attend a day camp or one where they stay for a week and sleep away from home, they're going to be in close contact with others at camp - a prime opportunity for those pesky bugs to spread from one head to another. What can you do as a parent? Take a close look at your children's hair regularly, especially after they've been playing with others or away at camp. With the bright outdoor light during summer months, you'll be able to spot lice and nits easier. If you do suspect lice, take action right away to get rid of every nit and louse, otherwise the infestation will get worse and spread to others. Little Bugs Hair Care provides safe, non-toxic solutions to eliminate those nasty bugs & their eggs without harsh chemicals or dangerous pesticides. Look for our prevention and elimination products at Amazon.com! 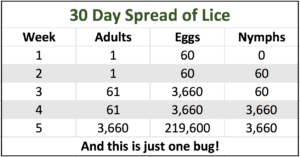 Head Lice & the Holidays - Are Those Little Bugs on the Increase After Christmas? While it may seem strange that the number of lice infestations would grow over the Christmas and holiday season when most children are out of school for a week or two, the fact is those pesky little bugs love attending a holiday get-together - even though they're definitely NOT invited! How does this happen, and what can you do about it? Lots of families travel to other loved ones' homes to spend a few days over the holiday season. Think of cousin Betsy, aunt Mary, uncle Bob, grandma, even little Johnny, the youngest cousin in the family. What happens when you all get together? Lots of hugs, lots of reminiscing, sharing great meals - and unfortunately, sharing lice if someone has an infestation. While we never discourage hugs, it's the perfect way for lice to find a new host because heads often touch! If you're spending a night or two, think about the youngsters and how they share beds or even a sleeping bag. Another opportunity for those little buggers to infest another head. Kids don't think about head lice, and little girls often love to play dress-up, sharing hair barrettes, brushes, and other hair accessories. It's the perfect opportunity for lice! Considering temperatures are cold during this time of year in many regions, it isn't unusual for kids to share hats or coats, either. The fact is, while you may not be able to prevent an infestation over the holidays, there is something you can do about it! At Littlebugs Hair Care, we provide safe head lice treatment using products that are natural and contain no pesticides. You can find our products at Amazon.com. Enjoy the holidays knowing that if your child does get an infestation, there's an easy, effective solution!